This is the Patreon campaign for DIAMOND GEMS, the Steven Universe dating sim. 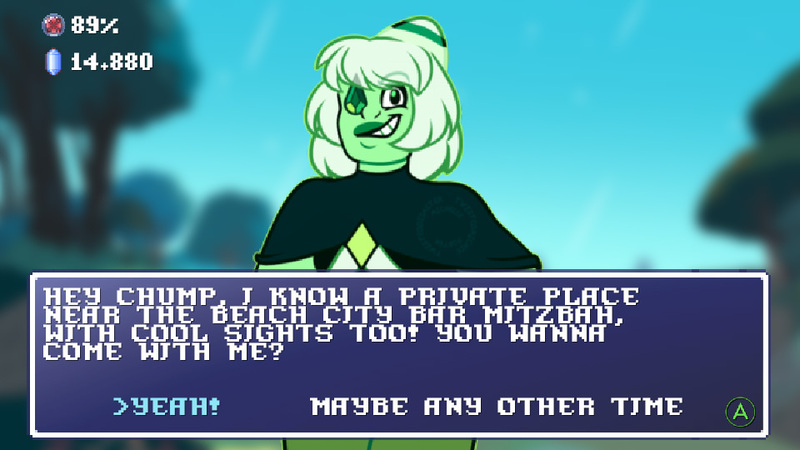 DIAMOND GEMS is a Steven Universe inspired dating simulator in which takes place in the metropolis of Beach City and its outskirts, where there’s a special emphasis on consent and the diversity of the LGBTQI+ community. The goal of this Patreon project is to fund the development of this game in its almost final stages. Right now, the game is 95% complete and in Alpha state, although I don’t see right showing alpha footage since it might spoil important story elements of the game. Either way, you don’t really see alpha footage for really important games such as Elder Scrolls 10, Quake 5, Super Mario Bros. 6 or Splatoon 3. This game has been 6 years in the making, polishing every single detail and feature to the point of being completely enjoyable and playable. Most of the years spent, in fact, in designing the complex dialog system that would make into 95% of the story (yes, even the coding for this is really confusing!). Also, 50% of the pledges of this campaign will go towards the charitable cause of the Open Society Foundation in its fight against racism and sexism in the US and Europe. 45 different and diverse Steven Universe inspired characters of diverse genders, sexualities and identities. Full character customization, with 400+ ways to customize your own Steven Universe character or gemsona in any identity or gender. Body-positive and LGBT-friendly sexual and romantic encounters. An open world bigger than ever, even bigger than Grand Theft Auto V or Skyrim. Deep storyline, multiple choices and multiple endings. Up to 25+ possible endings. Uncensored version and Fusion Mode, where instead of sexual encounters, there are Steven Universe brand gem fusions. Hi, my name is Narcissa Jenson, and I am the developer of DIAMOND GEMS, a Steven Universe dating sim. I am a transgender woman who’s very much into game development, and I worked alongside teams such as Polytron or Coffee Stain, now going fully independent as an independent game developer. Over the years, I’ve worked with such talents like Phil Fish or Tim Badylak in games such as Fez, Deep Rock Galactic or Goat Simulator. I was in charge mostly of the graphic design, level design and coding of such game hits. But now, I decided to go on my own to create my own video games as not only a career, but a passion. I am a big fan of the Steven Universe series, and ever since, I wanted to create my own adaptation of the Steven Universe series. I have my own gemsona, and her name’s Azure Agape. I felt proud of my own work in the 6 years of developing this game on my own. I hope you will like this new game project and thanks for the support! This is the basic support tier of DIAMOND GEMS, and I will thank you for your support very dearly! You will recieve a digital copy of DIAMOND GEMS when it's released! Your name will appear in the credits as the Producer, and along that you'll have access to alpha and beta releases of the game! This will cover the basic maintenance costs of the game release on the first 3 months, including the online maintenance and marketing.